A group of competitors travelled to Merthyr Tydfil with their Chief Instructor and Welsh Squad Kata Coach, Paul James, 5th Dan, and Instructor, Toni James, 1st Dan. The competition kicked off at 10am with the Children’s categories starting first. Fergus Tiddeman, Sioned Exley, Cerys Scott, Lowry Scott, Sophie Jones, Nathan Jones and Charlotte Smith competed in Kata, all performing very well. In Kihon Ippon Kumite, Sioned Exley and Cerys Scott did their best, with Cerys (3rd Kyu, brown belt) doing exceptionally well and winning the 3rd place to the podium and the bronze medal. In the Senior categories, the competition was fierce. The competitors had their mind in winning, and winning only they did. 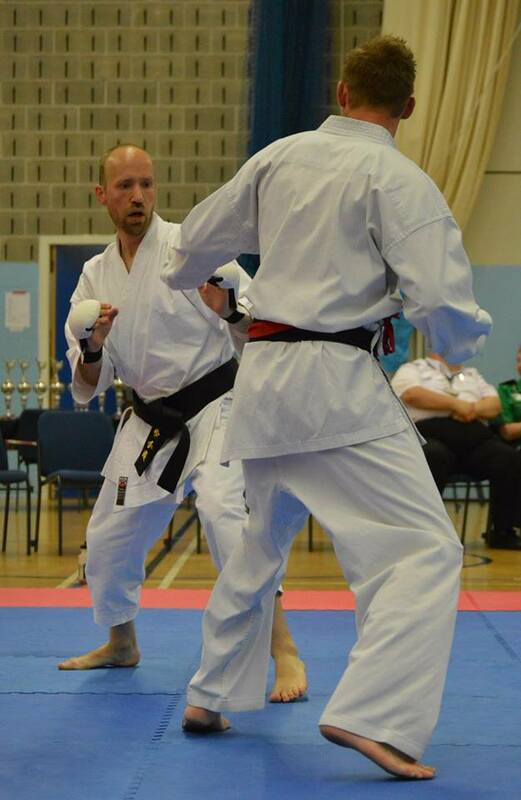 In the Individual Men’s events, Christopher Davies, Rostislav Revako, Bernard Tiddeman, Steven Bailey, Peter Ainsley and Nathan Theopanidies, competed against strong opponents in Kata and going one round after the other, Steven Bailey won a hard-fought place in the finals where he performed the Kata Unsu, winning the 3rd place. Rostislav Revako, Bernard Tiddeman and Steven Bailey, also competed in Individual Kumite. Some spectacular fights for strong nerves were fought by our competitors, narrowly missing a place in the semi-finals. At the Senior Men’s Team Kumite, on the other hand, our team, comprising of the same three karate-kas, turned the odds in their favour, beating the opponent team and participating in the finals and taking the 2nd place on the podium, leaving with silver medals and an air of achievement. The victorious team for the Senior Team Kata event of the night brought back to Aberystwyth some more bling, with Steven Bailey, Katharina Hone and Christopher Davies taking home the bronze, winning the 4th place in the finals in this very challenging event. In the Senior Ladies’ Individual events, Katharina Hone and Stefani Dritsa competed in both Kata and Kumite. At her first round, Katharina Hone performed against the final champion. The very strong Kata she did certainly convinced some referees, but unfortunately not all. Stefani Dritsa, despite being a 4th Kyu (purple belt/white stripe), took out all the opponents in her way to the finals, earning the 4th place and the bronze medal. Katharina and Stefani, also, entered the Kumite event, performing well under some of the finalists. Congratulations to all competitors for carrying proudly the name of their dojo, Ikkyo Aberystwyth and for bringing some “shinies” back to Aberystwyth. This entry was posted in Tournament and tagged 2014, Bernard Tiddeman, Cerys Scott, Charlotte Smith, Christopher Davies, Fergus Tiddeman, Katharina Hoene, Katharina Hone, Lowry Scott, Nathan Jones, Nathan Theopanidies, Paul James, Peter Ainsley, Ros (Rostislav Revako), Rostislav Revako, Sioned Exley, Sophie Jones, Stefani Dritsa, Steven Bailey, Toni James by admin. Bookmark the permalink.